Using gaming to engage employees has been proven effective in a number of different scenarios. Here are three stages of the employment process where gamification has been successful. How does your company use gamification to engage employees? Measuring employee engagement is crucial to ensuring that your organizations' time and money are well invested in these kinds of programs. Establishing a successful employee engagement and rewards program can be measured in just a few short steps. Social gaming is an emerging trend in social media, gaming, and employee engagement. Games like Farmville have engaged millions through Facebook, and that type of addictive social game experience is now being applied to health and wellness programs. 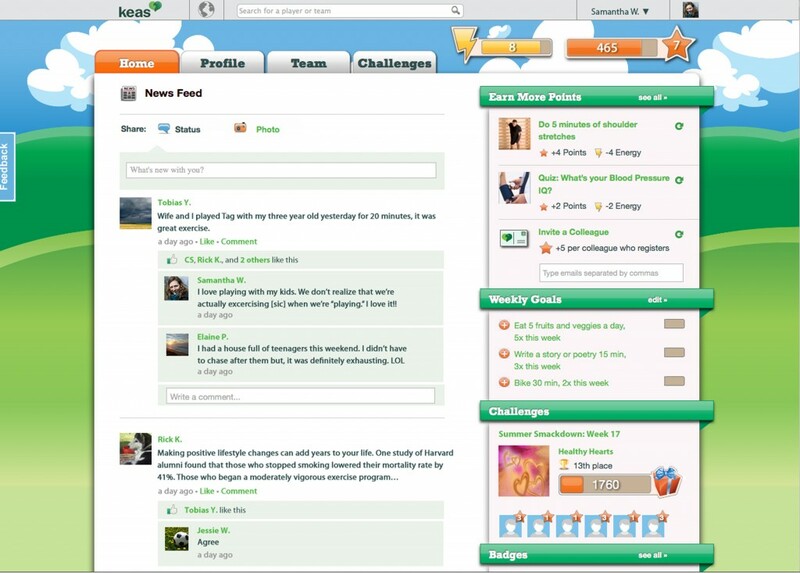 Keas is a social gaming application being used to promote office exercise, team camaraderie, and lower health care costs. The application eliminates lazy, sedentary lifestyles, helping employees lose weight and minimize chronic illness, while providing a fun interactive game experience. Employees can track progress and monitor their health improvement, while also interacting with and getting to know their coworkers. The interface, pictured above, looks very similar to popular social media sights such as Twitter and Facebook, which provides a level of comfort and familiarity to the user. To make this type of gaming even more effective, add rewards upon accomplishment of goals. Spot rewards such as gift cards can be great for these types of programs because the gift card like AutoZone, CVS, The Limited, and Charming Shoppes can be used to help the employee maintain a healthy lifestyle. Leveraging the popularity of social media can help lower your company's healthcare costs while helping employees live a healthy lifestyle. For more information on Social Gaming for Health and Wellness check out this Mashable article. Employee engagement is a proven way to raise employee morale, lower quit rates, and make your workforce more productive. Showing employees how their day to day work contributes to the bigger picture and helps the organization reach its goals leads to engagement. Conveying clear vision and providing a sense of importance is how managers can contribute to overall workforce engagement at an organizational level. Employees are the ultimate driver of an organization to its goals, so it is important to engage employees through training, professional development, and rewards ranging from useful gift cards to larger rewards such as vacation travel and extra time off. It is sometimes difficult to tell the difference between high employee morale and true engagement. According to Ronald Sanders, a senior executive adviser and fellow at Booz Allen Hamilton, engagement entails innovation, commitment, and employees choosing to use their discretionary energy at work. Engagement goes beyond a happy workforce to a deeper level of commitment to work and understanding of the importance of the job employees do every day. It is important to reward employees who reach this level so that they not only feel the importance of their position but so they feel supported by their organization. Reinforcing desired behaviors and attitudes is crucial to maintaining the engagement cycle into the future of the organization. For more information on deeply engaged employees check out this Federal Computer Week article. Great bosses lead to happy, content, motivated employees. When employees feel like their boss is investing in them they are much more likely to invest more of themselves into their work, which reflects positively on the business, and the office environment. Here are 5 qualities of a remarkable boss, and how it can help your business and employee productivity. 1. Develop every employee: Provide the training, mentoring and opportunities to allow your employees to develop and grow in their roles. Implementing goal oriented incentive programs that provide rewards such as gift cards, or extra time off is a great way to provide growth opportunities while providing added incentive for employees and staying within the employer's budget. 2. Deal with problems immediately: Ignoring problems can kill team morale. Addressing problems and changing processes internally in a timely manner can be difficult and time consuming but it maintains a positive, focused atmosphere in the office, free of politics and distractions. 3. Rescue your worst employee: Work with the "weak link" on your team to try to rehabilitate their image to the rest of the team by stepping up the coaching and mentoring you provide. 4. Serve others, not yourself: Putting yourself second to your employees and acting selflessly goes a long way in your role as the supervisor. It instills greater confidence in employees and reinforces their support system within the organization which will directly increase their productivity and motivation. 5. Always remember where you came from: Spend time with your employees when presented the opportunity. Spending small moments with employees provides a unique opportunity to inspire, reassure, motivate, and even give someone hope for their professional future. The higher your station in the company the greater your responsibility is to spend time with more junior employees. For more information on becoming a great boss and how to inspire your employees check out the Inc. article.